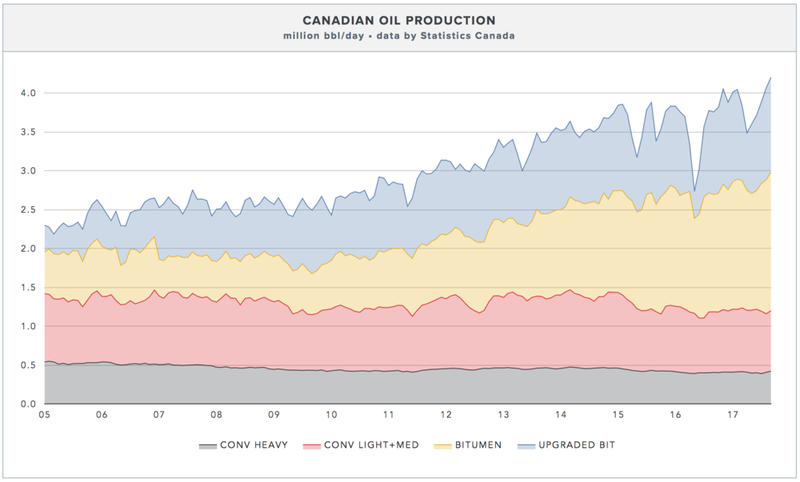 According to Statistics Canada, total Canadian crude output hit a record 4.2 million bbl/day in September, up 135,500 bbl/day the previous month and now 445,000 bbl/day higher than the same time last year. Gains were seen across all grades, including diluted bitumen, synthetic crude and conventional oil. But it's not all good news for Canadian producers as pipelines are already full to the brim and storage capacity in Western Canada is filling up fast. Start-up of Canadian Natural Resource's Phase 3 Horizon expansion this past quarter has added another 80,000 bbl/day of light crude to Alberta's supply. Suncor's Fort Hills Mine is also expected to begin production by the end of this year, potentially adding another 180,000 bbl/day of heavy oil supply to the grid by the end of 2018. The bottlenecks have widened Alberta's heavy oil discount to over US$20 a barrel, the highest since 2014, sending Western Canadian Select prices to just US$37 a barrel. 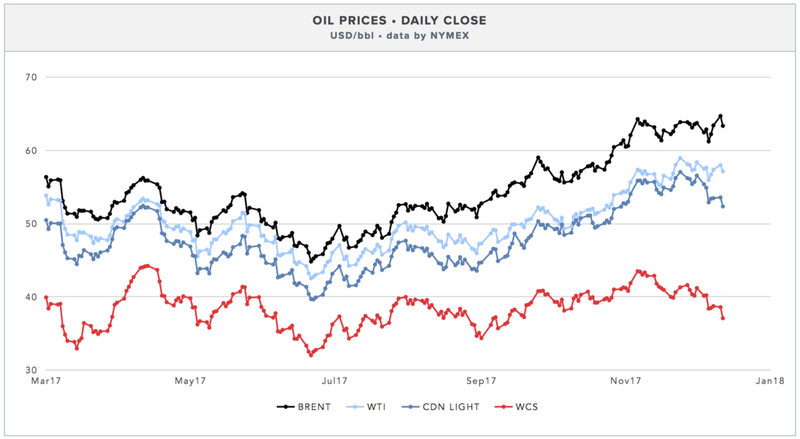 The differential for Canadian Light oil also took a hit, rising to almost US$5 a barrel, a 20% discount to international Brent prices. Enbridge says will start rationing space on its Mainline network, Canada's largest export pipeline to the US. The company says the constraints are being caused by unplanned outages in the western part of its system. Enbridge's 540,000 bbl/day Line 5 to refineries in the Midwest was also disrupted last week due to bad weather. The pipeline constraints are forcing more crude onto rail cars. Crude-by-rail loadings across the country has been rising steadily since the summer. Crude Exports to the US by rail have tripled from the summer of 2016, rising to 134,000 bbl/day in September. According to the National Energy Board, production is expected to rise by another 20,000 bbl/day through the remainder of this year. Both Enbridge and Kinder Morgan have warned their respective expansion projects, Line 3 Replacement and the Trans Mountain Expansion, will likely not be operational until late 2019 or mid-2020 at best.